Viewing huge log files for trouble shooting is a mundane routine tasks for sysadmins and programmers. 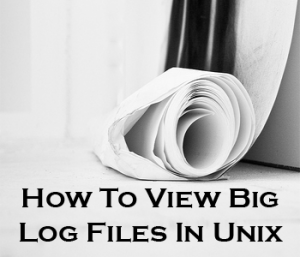 In this article, let us review how to effectively view and manipulate huge log files using 10 awesome examples. View only the specific lines mentioned by line numbers. sed : sed command, which will print all the lines by default. FILENAME : name of the file to be processed. The example mentioned below will print the lines 120, 145, 1050 from the syslog. In the following example, you can view the content of var/log/cron from line number 101 to 110. This example displays only first 15 lines of /var/log/maillog file. Change 15 to 10 to display the first 10 lines of a log file. This example shows how to ignore the last N lines, and show only the remaining lines from the top of file. The following example will display all the lines of the /var/log/secure except the last 250 lines. This example displays only last 50 lines of /var/log/messages file. Change 50 to 100 to display the last 100 lines of the log file. This example shows how to ignore the first N-1 lines and show only the remaining of the lines. The following example ignores the 1st four lines of the /etc/xinetd.conf, which contains only the comments. This is probably one of the most used command by sysadmins.To view a growing log file and see only the newer contents use tail -f as shown below. The following example shows the content of the /var/log/syslog command in real-time. cat : prints the whole file to the stdout. tail -n +101 : ignores lines upto the given line number, and then start printing lines after the given number. head -n 10 : prints the first 10 line, that is 101 to 110 and ignores the remaining lines. Example 8: Display lines matching a pattern, and few lines following the match. The following example displays the line that matches “Initializing CPU” from the /var/log/dmesg and 5 lines immediately after this match. Refer our earlier article Get a Grip on the Grep! – 15 Practical Grep Command Examples that explains how to use grep command. As explained in our previous grep command article, the following operations are possible. Viewing specific lines identified by patterns, which is grep’s default functionality. Viewing only the matched characters. Viewing N lines after the match with -A option. Viewing N lines before the match with -B option. Viewing N lines around the match with -C option. Example 9: Displaying specific bytes from a file. The following example explains how to display either the top 40 or the last 30 bytes of a file. Display first 40 bytes from syslog. Display last 30 bytes from syslog. After a specific time all the system log files are rotated, and compressed. You can uncompress it on the fly, and pipe the output to another unix command to view the file as explained below. Display the first N lines of a compressed file. Display the last N lines of a compressed file. Ignoring the last N lines of a compressed file. Ignoring the first N lines of a compressed file. Viewing particular range of lines identified by line number. If you need to return, bookmark this page at del.icio.us for handy reference. I have used example 8 many times looking for a response to a specific error. I have also used the tail and head commands as well, never really got into sed so much, but that example was a good one. Thanks for posting this information. FYI: Later versions of less(1) also displays .gz files. This will give you only the lines containing the keyword as it gets logged. Edit: oops — how embarrassing. You covered it and I missed it somehow. p Print the current pattern space. Sed can do lot of amazing things. But it is hard to remember those on top of your head. I have close to 100 sed command that solves some common problem in a notebook, which I copy/paste whenever nedded. Thanks for pointing that out. Most of us forget that grep can be combined with “tail -f”. This indeed can be very handy. I’m very glad that you found this article helpful. Yeah. That is the beauty of Unix. We can do amazing things with linux commands that were not even clearly mentioned in the manual. This is also the reason Windows admins don’t like Linux, as they hate reading manuals. Even when they read the manuals, it is not really explained very well. Nice Article, uses of head, tail, and sed were nicely covered. Thanks for the same. The sed tip I will use for sure and I also like the tail -f |grep. Thank you Ramesh. Any chance you will be posting your most useful sed commands from your note book at some time? Great stuffs. Thanks for sharing. You showed zcat, but there is also bzcat and lzcat, and probably a few others. so if you have a file that is bzip2’d or lzma’d, then you can use bzcat and lzcat respectively to display them. Also, it can be piped to the less command so it can be scrolled across the terminal. Is the following any better (i.e. more efficient) than zcat logfile.gz | tail ??? and hence the use of the pipe is redundant (‘$’ stands for the command prompt). Both lets you scroll through the logfile and search for pattern using ‘/’ and ‘?’ (similar to vim). will — through only the the lines that has the matching pattern “PATTERN”. How do I get all the lines between the first and last occurance of a string in a log file. Really helpful post. But how can we make changes in a large file or we can open a large file in edit mode?? I have a requirement like getting all lines of a log file which were added 5 minutes before ? grep “Jan 3 00:5[1-6]” /var/log/messages. This will print log messages from Hrs 00:51 to 00:56 for January 3rd. Can you help me to write shell script which will continuously poll the logfile for an error. If any error comes then will email that error. am looking bash script for grep last 5 minites entry from log file , i have try to many script but ots not working , i think there have some date formate issue is there , can u plz help me .